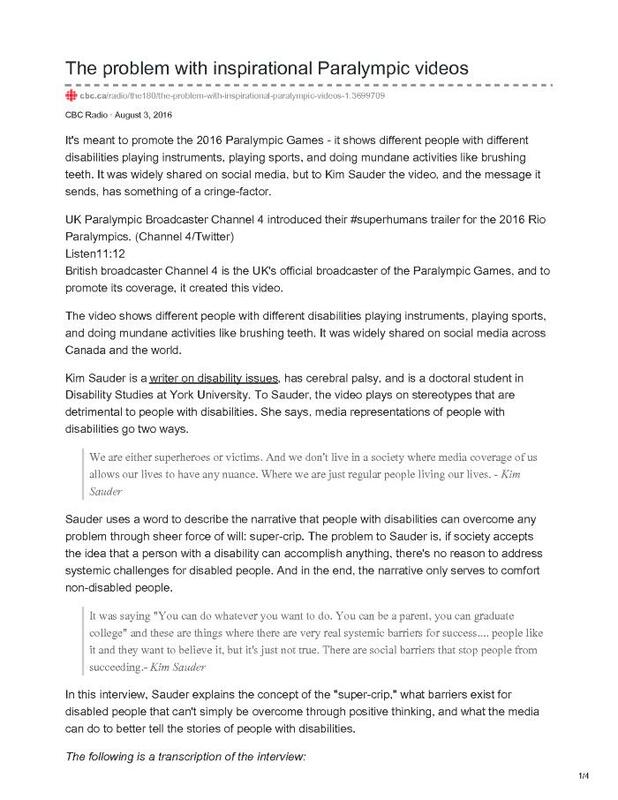 CBC Radio's The 180, talks with disabled writer and scholar, Kim Sauder about Channel 4's trailer for the 2016 Payalympics. Kim discusses the dichotmous nature of disability stereotypes in media, stating, "we are either superheroes or victims. And we don't live in a society where media coverage of us allows our lives to have any nuance. Where we are just regular people living our lives". She notes that the Channel 4 ad perpetuates the stereotype of the "super-crip", disabled people who have 'overcome' their disabilities to achieve anything they want, without addressing the multiple systemic barriers that disabled people face in their daily lives.